Net Applications has released the latest version of its Internet Operating System Marketshare report, and it reveals some interesting information about the popularity of Apple’s iPhone. After just five months on the market, the iPhone commands .09% of the marketshare of devices browsing the Internet. The iTouch adds another .01%. Together, Apple’s handheld Internet devices are already about 1 in 1000 machines surfing the Internet. To put that in perspective, the iPhone has leapfrogged Windows CE, the basis of Windows Mobile devices. Windows CE has been around for 10 years. While the iPhone hasn’t been around nearly as long other mobile devices, and there aren’t nearly as many iPhones in the field as other Internet devices, the iPhone’s combination of a large screen, a powerful browser and unlimited Internet access has helped it to leapfrog over not just Windows CE devices, but Web TV, the Playstation 3, the PSP and the Nintendo Wii. Apple CEO Steve Jobs has stated that he plans to sell 10 millions iPhones in 2008. If Apple meets that target, iPhones could account for about 1% of the devices that people use to connect to the Internet by the end of next year. That’s more than Windows ME, Windows NT and Windows 98. Think Steve Ballmer is still laughing? THIS IS THE MOST IDIOTIC THING I HAVE EVER READ. .09% AND YOU MACTARDS ARE HAVING A CORANARY ABOUT IT. CAN’T YOU SEE XP UP AT THE TOP OF THAT CHART? AND WHO’S NEXT? THAT WOULD BE MICROSOFT VISTA WITH A THOUSAND TIMES THE MARKET SHARE OF THE IPHONE! YOU ENJOY YOUR $600 PHONES – I THINK I’LL USE MY $600 TO BUY A WINDOWS SMARTPHONE – AND HAVE $500 BUCKS LEFT OVER!! Golly, arwen, tell us how you really feel about it, won’t you? Are you really that torqued-out about the article, or are you upset because your CapsLock key is broken? 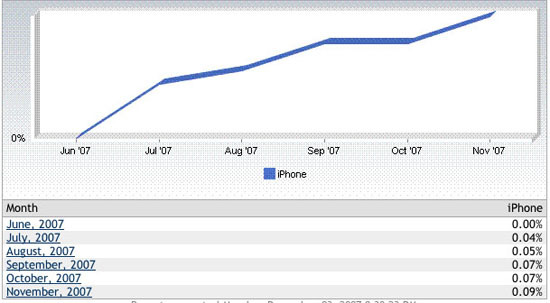 OK Apple freaks – where’s the scale on that graph hyping the iphone growth? If you added a 0-100% scale onto that chart, the iPhone market share growth would be pretty much a flat line. What’s with the knee-jerk emotional response to a market share article? A lot of people bought a somewhat expensive phone, it’s become more popular than some competitors devices based on browser use statistics, and you flip out because someone writes an article about it? After just five months on the market, the iPhone & iPod Touch account for about 1 in 1000 machines surfing the Internet. That’s pretty impressive. The article makes a point out of mentioning that the Apple devices outnumber Windows CE Smartphone devices as well as some game consoles and WebTV on the internet. Not desktop machines. So shouting about XP and Vista is rather pointless here. It’s interesting to note that Windows based phones far outnumber iPhones in the wild, so this means most people aren’t browsing the web on their Windows phones. Maybe they can’t figure out how. Gotta figure out that caps lock key first. You know what else is impressive? According to Quantcast.com, podcastingnews.com gets around 23,000 visitors a month. If all 23,000 of those people see this article and Arwen’s comment, around 23 of them will realize he’s a moron from their iPhone or iPod. Most of the rest of them will come to this obvious conclusion on a Windows machine (which is more likely to be connected to an iPod than a Zune or anything else). To spell it out in even more simplistic terms: The chart covers most operating systems accessing the internet, but the thrust of the ARTICLE is the comparison of use and growth versus competitors in it’s field. The iPhone isn’t intended to compete with a Mac PC or a Windoze PeeC! Interesting to note, for those failing to make the OS distinction (and to rub a little salt in the wounds), Windows is overall losing share on the internet, whereas Mac is gaining share (in this case I’m only talking about computers, not phones, PDAs, or game consoles… and even if I were, it would still be true).